Aaron Anderson is a junior at the Henry Ford School for Creative Studies. 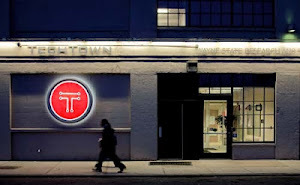 The school's curriculum is centered on art and design, offering students real-world applications. In addition to academic knowledge, students develop their creative thinking and problem solving potential. All students at Henry Ford Academy must complete a senior practicum – a program similar to co-operative education – with a professional who practices in a creative field. Centric Design Studio was contacted by Henry Ford Academy to participate in their senior practicum program, and Aaron was placed with our firm for the winter semester. Although he takes mandatory art classes in school – product design this semester – Aaron has gained hands-on skills in architectural and graphic design, model-making and building product research during his time at CDS. 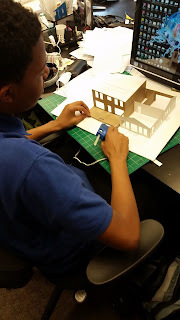 When asked what he learned about architecture that he didn’t know before his experience with CDS, Aaron exclaimed enthusiastically, “A whole lot!” He built an architectural study model for one of our current projects: an addition to a private residence in Detroit's Palmer Park neighborhood. Architectural designer, Shanita Rutland, taught Aaron the fundamentals of model-making. Aaron also researched radiant heating. CDS is proposing to incorporate system in a client’s residential renovation. Searching the internet, he discovered that radiant heating was invented by the Romans. He reported how the system is currently installed, how it functions, and product costs. See Aaron’s findings and presentation on SlideShare. Aaron wants to pursue a career in architecture. He “likes the look and feel of new and old projects” and exploring the renovation of old buildings for new uses. In addition to his model-making and product research tasks, he was able to increase his proficiency with Adobe Illustrator and Photoshop by using the software to add human silhouettes to architectural renderings and to create a new logo for a client. Aaron now has a portfolio of work from CDS that he will present at school to conclude his practicum. This work can be presented in his college applications as well. We were glad to have Aaron as part of the Studio and to help him gain practical experience in the architectural profession.